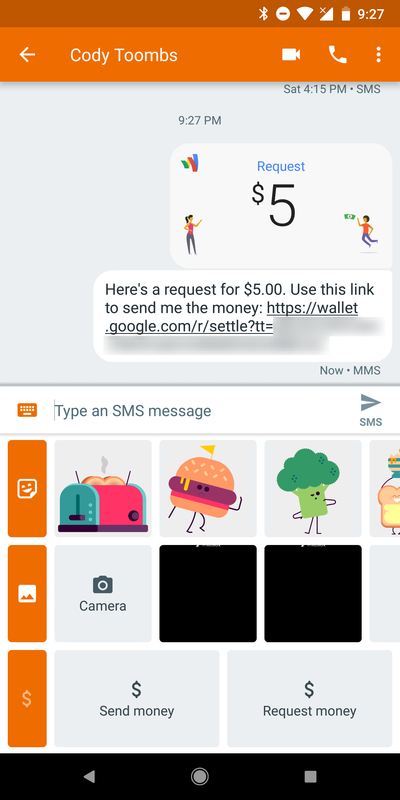 Money transfers have also gone live in the Android Messages app, at least for some. 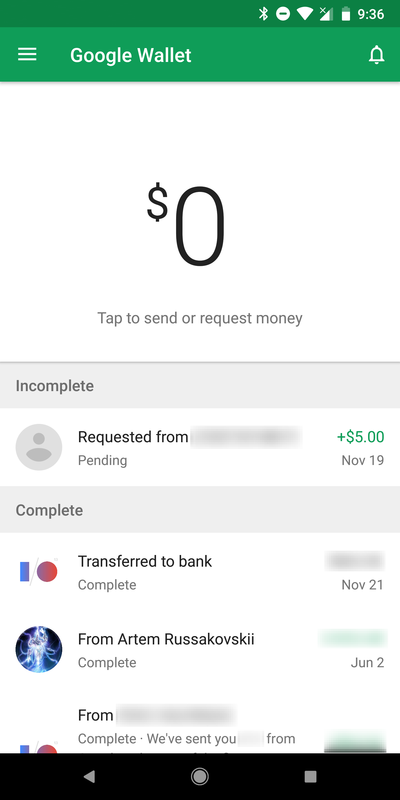 Hit the '+' button to bring up the attachments screen, which seems to have gone live for almost everyone in the latest update, and scroll down a little bit to see a row with two buttons: Send money and Request money. 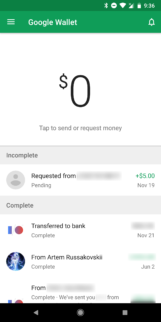 You'll be prompted to select a Google account the first time you start using either money transfer feature, then you'll move on to setting an amount. You can always switch accounts from an overflow menu on that screen. Once an amount is set, it will be shown as an attachment in the message box. 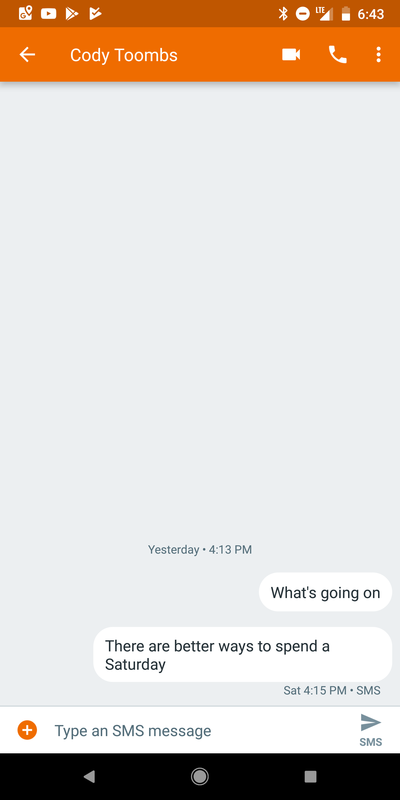 Hit send and it will fire off a message and link to the other person. You'll also get an email with your request. 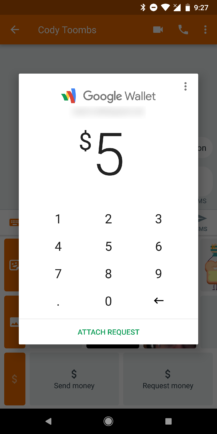 The recipient will get the text message and should also see a pending request in their Google Wallet app if they have it installed. Some people I've checked with are saying this isn't yet available to them, which makes it sound like money transfers are a staged rollout. If you don't have access yet, it will probably go live for everybody soon. A teardown in late-September turned up a sign that Android Messages would soon allow for launching calls to your contacts over Duo. This was later confirmed by Google's support docs. While v2.6 never went public, the Duo integration appears to be going live with v2.7. 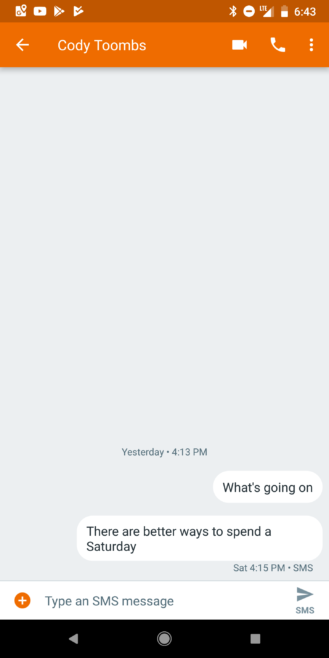 For contacts that have registered with Duo, a video camera icon should appear in the title bar of conversations in Android Messages. Tapping the icon will immediately start a call to the contact. 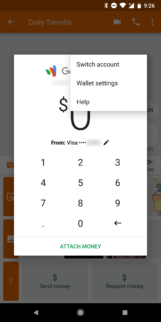 Be advised, there is no confirmation prompt or warning, the call happens immediately after tapping the button. If the Duo button isn't appearing for you yet, there's a good chance it's still rolling out. One of my phones can get it while the other doesn't, so there's either a staged rollout or a bug is interfering with seeing the accounts properly. – Thanks, Peter! We just saw it happen a few days ago with a Google Play Music update, and now Android Messages is following in its footsteps by eliminating the bundled micro-APK for Android Wear. This time, the total size of the APK is down a whopping 5.7 MB, or about 30% of its total size. If any of your friends have a bad habit of spamming a series of short text messages, it might not always be obvious where the old messages end and the new ones begin. Aside from looking at your last reply, there aren't many easy ways to identify new messages. This is about to get a little easier as Google prepares to give you a count of the new messages when you open a conversation. Update: It's live, see the description above. When v2.5 of Android messages came out, we saw that it would include a feature to send or request money from your contacts via a text message. While it was was likely that Google Wallet would facilitate this transaction, there was no specific evidence of that until a Google Wallet update came out with clear confirmation. 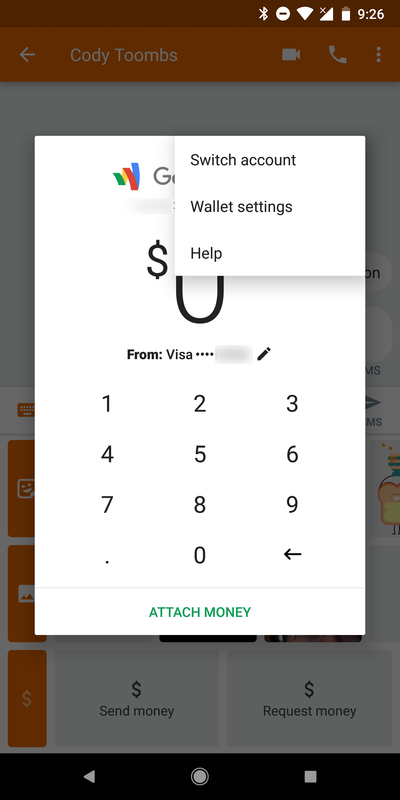 In this update, the Wallet icon can now be found in the resources. This doesn't rule out Tez as a possible option in India, but there's no sign that it will be an option yet. "Here's a request for $35. 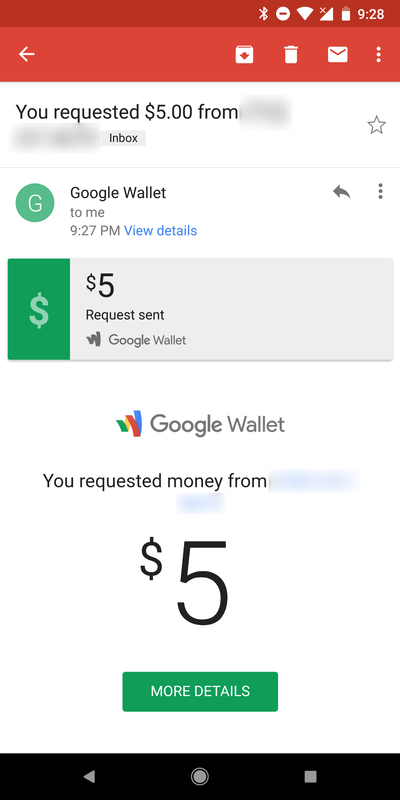 Use this link to send me the money:"
"Here's $35. 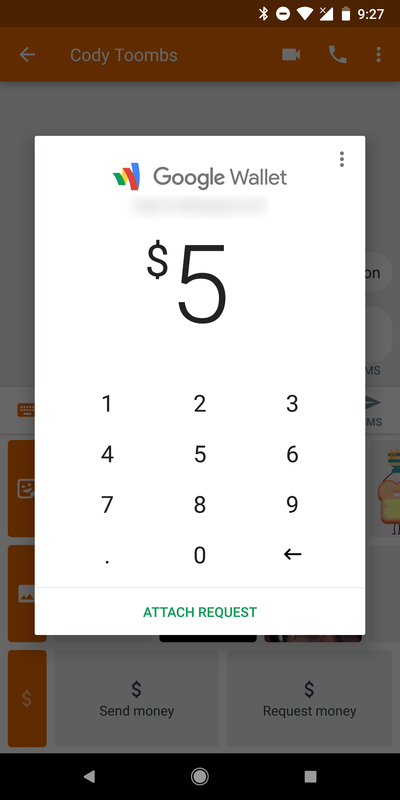 Use this link to accept the money:"
It seems like Google's focus on supporting dual-SIM phones is heightened lately. Last week's update of the Phone app came with signs that it would see improvements to the dual-SIM support for making calls. Specifically, it would allow you to quickly choose which line would be used for making calls instead of forcing users to open their phone's Settings app to switch between SIMs. Now the Android Messages app appears with new text related to turning on RCS for individual SIMs. The text doesn't say too much that's interesting, it only provides promo text suggesting that users turn on enhanced messages for a specific SIM, as opposed to the previous text that makes no mention of separate SIMs. It also acknowledges sending messages over Wi-Fi and getting added features like seeing when your friends are typing replies – all pretty standard stuff with RCS.